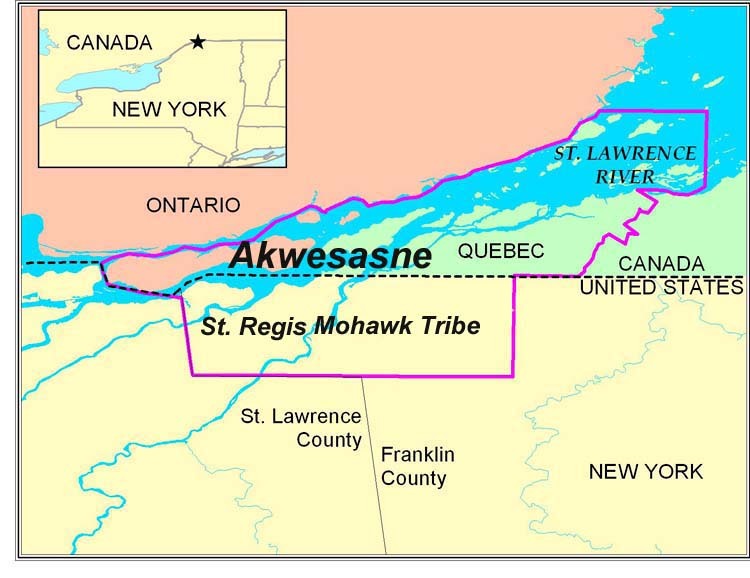 Learning about the geography of Akwesasne is essential to understanding the daily struggles of the Akwesasne Mohawk Community, and the jurisdictional conundrums that were at the heart of my research this summer. 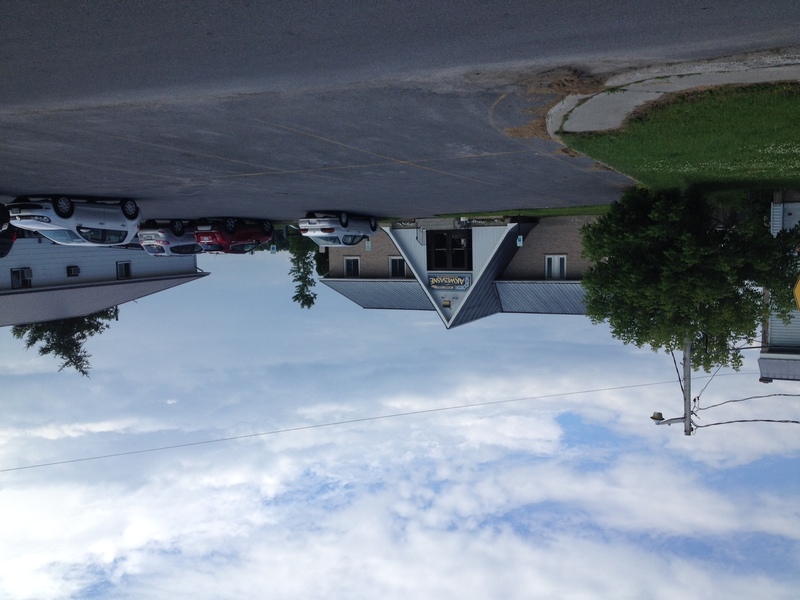 I will take you through my daily drive to get to work and back, which begins to give you a sense of the complexities underlying the Akwesasne territory. 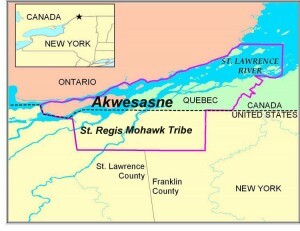 I resided in the City of Cornwall, and was working at the Akwesasne Justice Department in Kanakaton (St Regis). Leaving from Ontario, the first stop is a bridge toll for the Three Nations Bridge, which crosses the St Lawrence River to Kawehnoke (Cornwall Island), connecting Canada to Akwesasne. 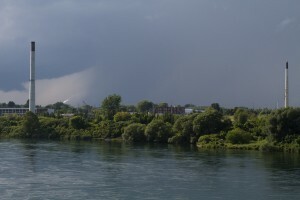 The Island, as the locals call it, is the part of the reserve situated in Ontario. Getting off the bridge, it becomes clear that you’ve entered a different Nation. 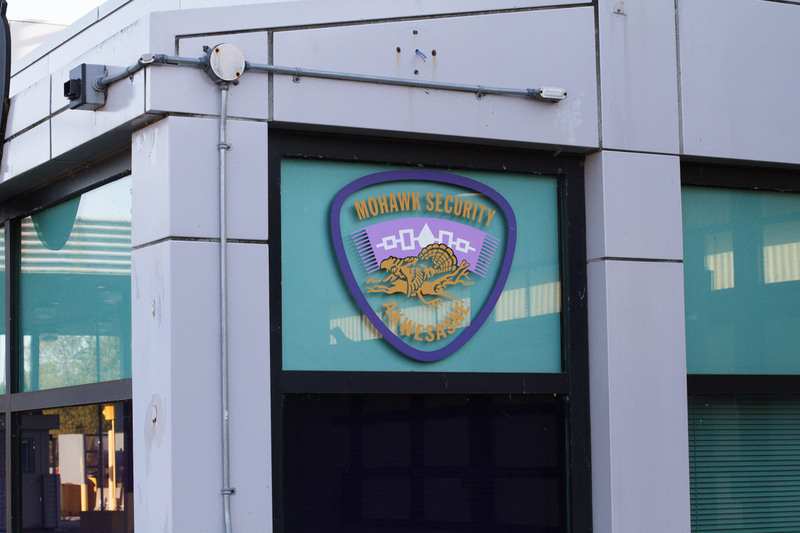 You soon see a Haudenosaunee (Iroquois) Confederacy flag, a tax-free gas station, road signalization and advertisement in the Mohawk language, a sign saying “You Are on Indian Land”, and another “Cocaine and crack will cost you more than money”. 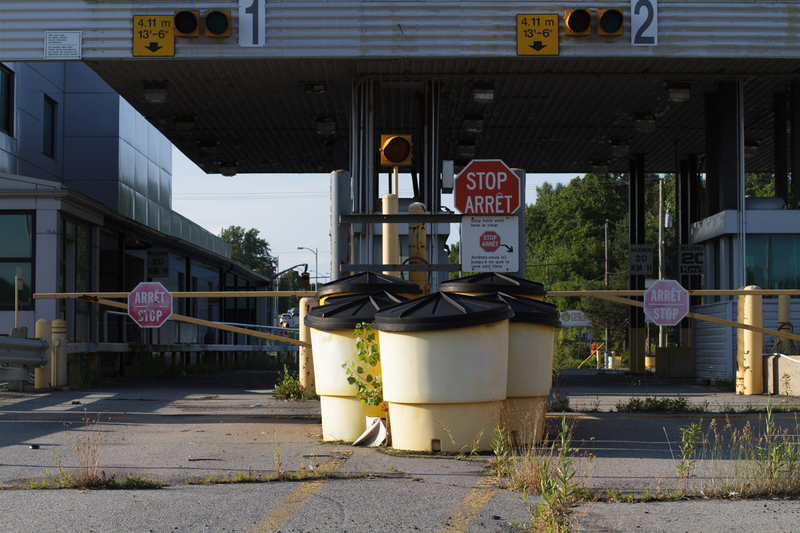 Within a few hundred meters, you come to a stop sign, which stands in front of an abandoned Canadian border-crossing checkpoint. 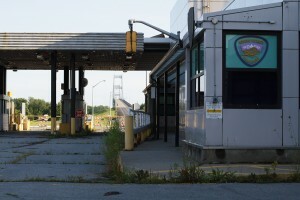 The Cornwall Island port of entry was closed in 2009 as a result of protests resulting from the Canadian Government’s decision to arm border agents. 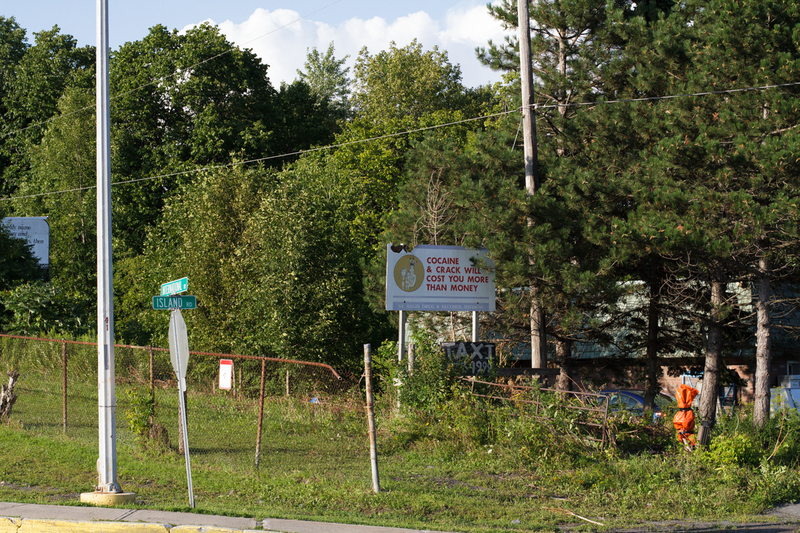 The Akwesasronon (the people of Akwesasne) refused to have armed CBSA agents in a residential area. 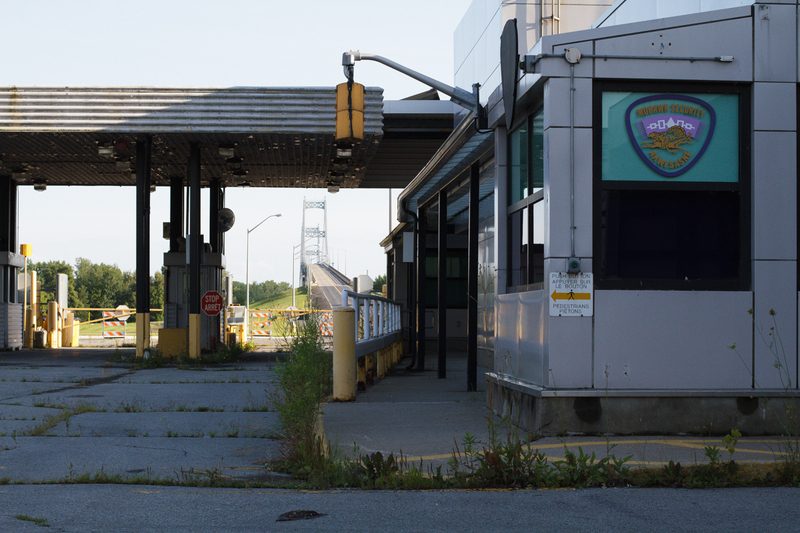 After you pass by the abandoned border station, you reach the foot of a bridge, which marks the Canada-US border. 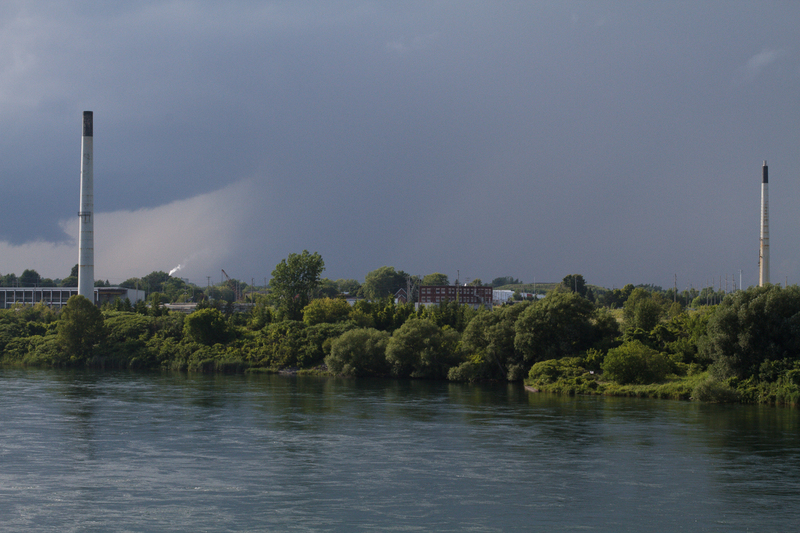 On your right you will see the Aluminum Corporation of America plant (Alcoa), which in 2013 negotiated a $20 million with the Mohawks for a more than 60 year legacy of polluting the St Lawrence River Watershed. 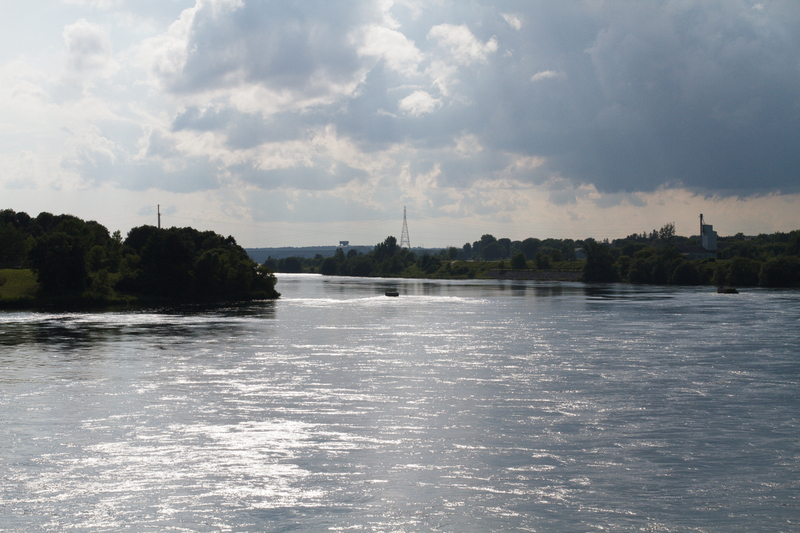 These seriously inadequate funds are intended for the restoration of recreational fishing, fish and wildlife, and Mohawk traditions and languages. 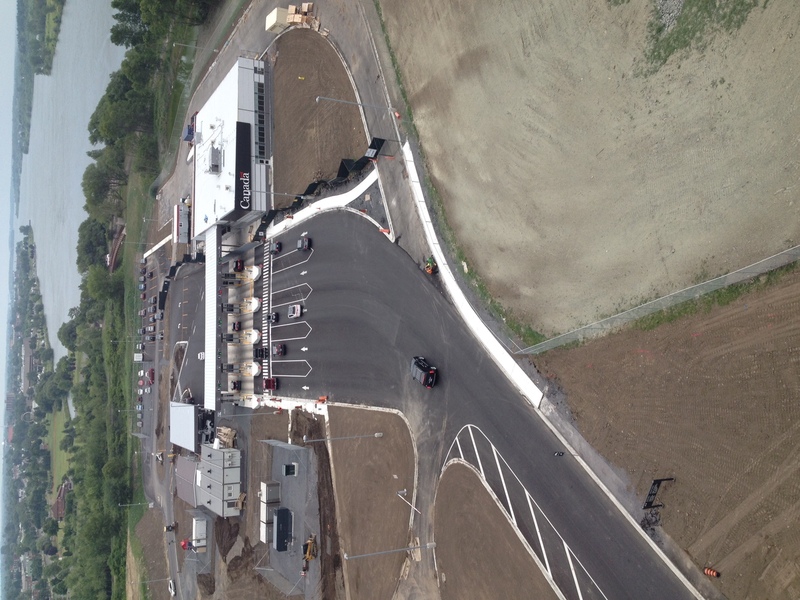 On the other side on the bridge, you soon come to the Massena US border checkpoint, situated on the US-NY state side of Akwesasne. 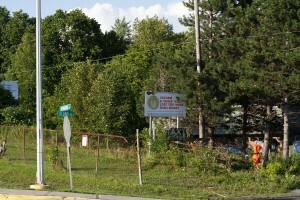 A sign bearing the message “Welcome to the Empire State” greets you at the first traffic light, which leads you on to the prosaically named Road 37 that crosses the Raquette River taking you through “US side” of Akwesasne. Here one views more tax-free gas stations, both of the operational and abandoned variety, an abandoned Casino, craft-stores, outlets for tax-free tobacco and alcohol, and several Tribal administrative buildings. After ten minutes, you turn left turn just before crossing the St Regis River. The smaller road that brings you to Kanakaton stretches through a residential area on the US side. Owing to a lack of zoning regulations the houses are aligned in an unconventional way on this part of the road, and properties are rather large. However, the landscape drastically changes once you arrive at Kanakaton, commonly referred to as “the Village”. Streets are smaller, narrower, properties are smaller and it is more densely populated. 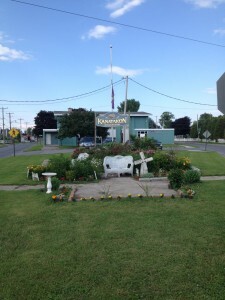 When you arrive at the Village on that small road, it is easy to not realize that you have crossed the Canadian border. Apart from a small seam in the road where the American paving crew stops and the Canadian one begins, and some metric signage, there are no landmarks suggesting that you have entered Quebec. No border crossing checkpoint, no sign, so surveillance camera, etc. Yet, for non-Akwesasronon, missing the border can very costly. 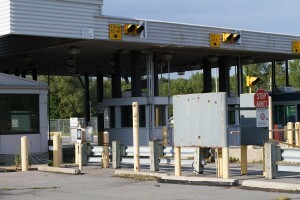 Although there is no checkpoint in St Regis, there is a border, and it means that since you have entered Canada, as a non-Indigenous person, you have to report at one of the US border checkpoints, be it Massena, Fort Covington, etc… when you leave the Village to go anywhere else in the US or on your way back to Canada. Furthermore, once you leave St Regis, you are not allowed to stop anywhere in the US before “reporting in”. If you fail to report in or stop somewhere on the way, the US border agency can impound your car and charge you $1000 to retrieve it on the first occasion, $2000 for the second, $3000 the third time, after which they will confiscate it permanently. 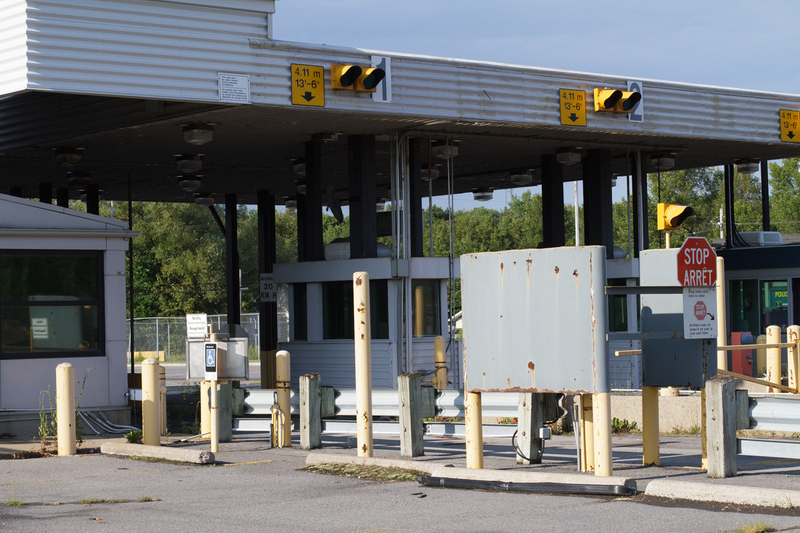 Returning to the City of Cornwall from the Akwesasne Justice Department, you must first stop at the Massena US border checkpoint. You have to park the car, go inside the building, and show your passport. 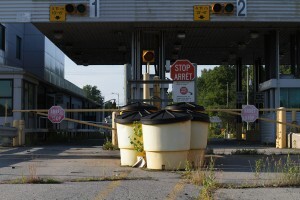 The first few weeks, I was asked by the border agents whether I had stopped anywhere on US territory on my way back from St Regis, and whether I had bought any goods in Canada. After a month of stopping everyday they ceased to ask me any questions or look at my passport. They would say “Reporting in? You’re set. Free to go.” You might, as I did, find this attitude upsetting, as Akwesasranon waiting behind you receive a very different treatment from border agents. Once cleared, you drive back across the bridge to Cornwall Island, and have to make sure to not stop anywhere on the Island as you make your way to the Canadian border check-point. 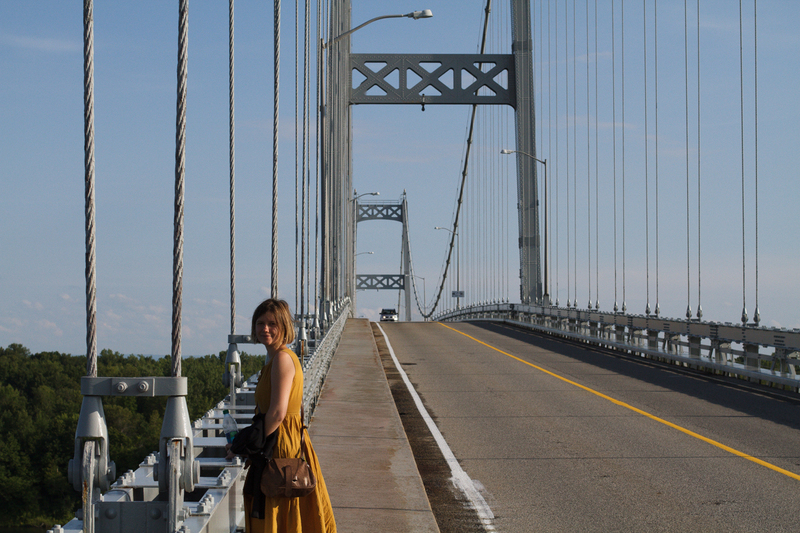 You must head straight to the Three Nation Bridge, cross the St Lawrence to Mainland Canada, pay a $3.25 bridge toll, then pass through the Canadian border checkpoint. It’s only at this point that you may backtrack to Cornwall Island if that is your final destination. Again, it is because Cornwall Island is technically Canada and there is no border crossing on the Island, you are not allowed to stop on your way, and must head straight to the Canadian border checkpoint. If you don’t follow these rules, this time you risk the Canadian officials confiscating your vehicle. However, and importantly, Canada is less flexible than the US, and applies this rule to Akwesasranon and non-Akwesasranon alike. 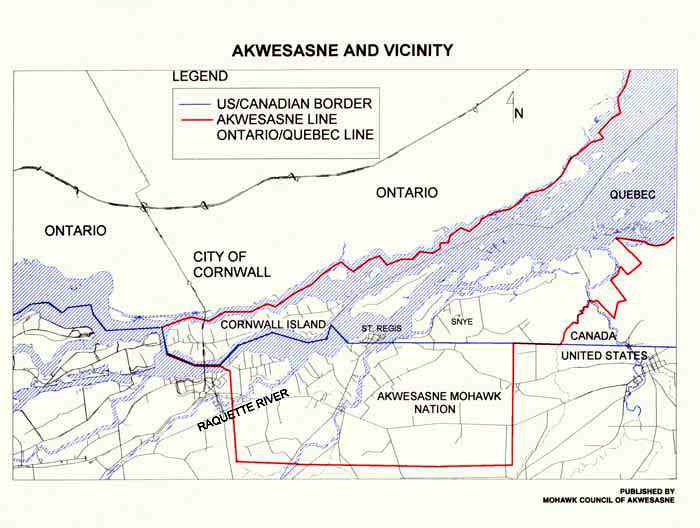 This has serious implications for the residents of Cornwall Island, and of Akwesasne more generally. 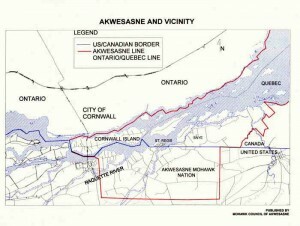 It means that whenever someone is going to Cornwall Island from other parts of Akwesasne, they must take the extra step to cross the Island without stopping, cross the toll bridge, get cleared by the border (they are often subjected to discriminatory treatment and other human rights violations, which has spawned several lawsuits), cross the toll bridge again, and across the bridge, before finally reaching their destinations on Cornwall Island. 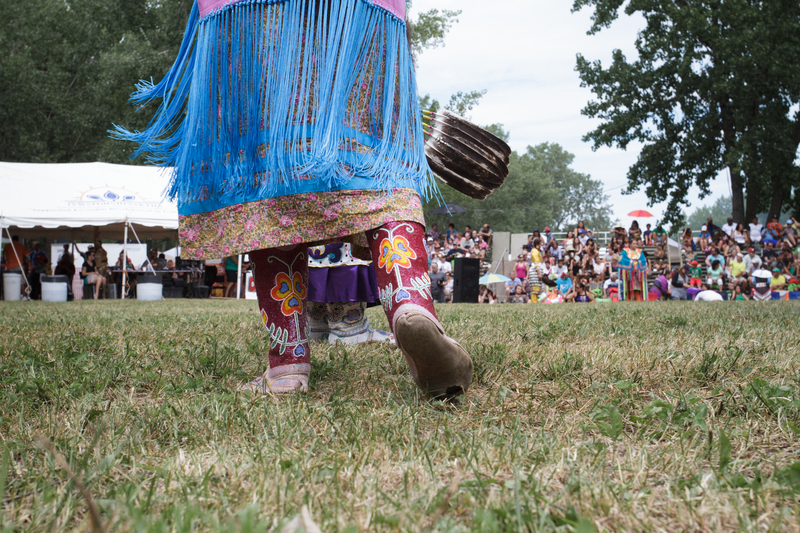 I will leave it at that for now, and look forward to telling you more about my work at Akwesasne, and hearing about your experience on Friday. Happy Labour Weekend! 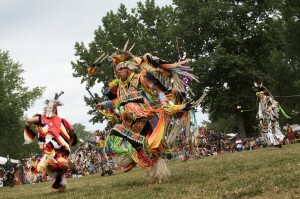 Oh, and if you’re interested, Akwesasne is having one of its most anticipated events of the year next weekend, check it out at: http://www.akwesasnepowwow.com/. In July, I went to the Kanhawake Pow Wow, and it’s worth the trip! Published by cecilecapelalaborde on August 31, 2014 at 10:49 pm under Uncategorized. 0 comments. Hostis humani generis: “enemy of humankind.” The immense weight behind this Latin phrase is well known to those fascinated by either the modern or historical world of piracy. Historically, the status of these universal enemies was well known. According to the masses, pirates had availed themselves of the benefits of society, reduced themselves to a savage “state of nature”, and declared war on all humankind. And so, in this same Hobbesian spirit, humankind responded by categorically declaring war against pirates. Thus, when these enemies would bear down upon a coastal town with rapacious savagery, the town would not stand idle and witness their own demise, but instead rally their troops and defend their livelihood with equal measures of violence. Indeed, because the pirates had been declared enemies of humankind, the town would not only have the right to self-defense, but they were further given the right to punish captured pirates in a brutal manner fitting of this “state of nature.” And so, as if torn from the pages of Leviathan, the law of nature governed the fight against hostis humani generis. This study points towards a significant incongruity between the application of universal jurisdiction and its underlying rationale. However, can this criticism be applied to modern maritime crime? Garrod argues that it can, stating that there is no evidence to suggest that the fight against piracy in Somalia is a result of states attempting to protect international community values. This is a strong stance to take on the issue, and is likely to be challenged by organizations such as the UN, who describe the fight against piracy as a collective international responsibility. Indeed, the applicability of universal jurisdiction to crimes like piracy and genocide has been a subject of debate before the UN General Assembly since 2009, and both sides are far from reaching an agreement on the matter. Regardless of one’s stance on this issue, Garrod’s research raises a legitimate question as to the underpinnings of universal jurisdiction, and continues to fuel the debate surrounding this 400-year-old law. Published by kylebest on August 21, 2014 at 1:46 pm under In the field. 0 comments. Anecdotally, the Canadian flag is commonly found sewn on to the backpacks of our international travelers. The conspicuous yet modest display of our nationality used to make perfect sense, given our reputation as holders of progressive values and friendly demeanors. However, while I value genuine patriotic sentiment, I would caution that, from a strategic point of view, this approach may backfire in certain parts of the world today. 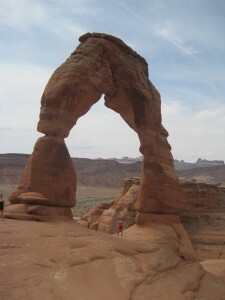 The inertia in our approach to environmental stewardship is certainly a general factor behind the decline of our reputation, and this post will focus on a particularly aggressive aspect of this neglect. Canadian mining companies are dominant players on the international mining scene, and in some cases may have contributed to human rights violations without ever having been held liable. The point of this post is to highlight recent and ongoing legal developments pertaining to these issues. While I am currently working for One Earth Future on a report about human rights concerns surrounding state-owned oil companies from emerging economic powers such as China, I learned that Canadian enterprises are also seriously implicated in these issues. Approximately 75% of the world’s mining companies are Canadian in the sense that they are based here and listed on our stock exchanges, such as the TSX. A leaked report commissioned by the Prospectors and Developers Association of Canada found that out of 171 companies identified in incidents involving extractive companies in the decade leading up to 2009, 34% involved Canadian companies. 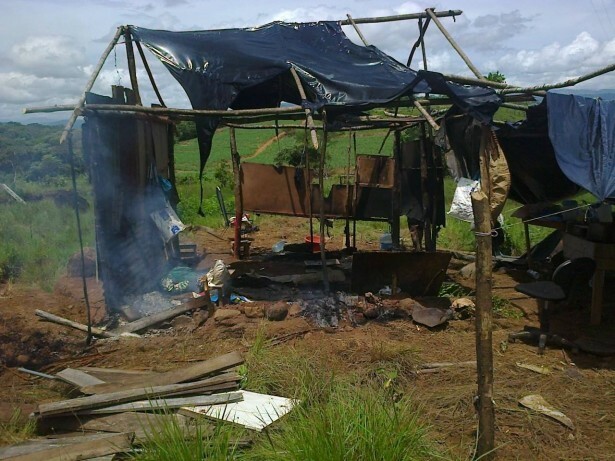 Incidents included cases of community conflict, environmental degradation, and unethical behaviour. It should be noted that methodological issues with the report have been raised, and that the numbers correspond with Canada’s position in global mining. The scope and severity of Canada’s contributions to these violations may be hard to precisely assess, but at the very least and in careful language, I think one could say that there is a problem that needs fixing. Of course, mining operations within Canada are certainly contentious, particularly with regard to their impact on the environment and ignorance and neglect of aboriginal rights, and I look forward to learning about our domestic situation in this fall’s mining law seminar course. But when it comes to mining operations abroad, the situation is absolutely void of Canadian regulation. Instead of regulation, there are voluntary principles and corporate social responsibility practices. In 2010, private member’s Bill C-300 was narrowly defeated in the House of Commons by a final vote of 140 to 134. The bill would have mandated DFAIT to set corporate accountability standards for Canadian oil and mining operations abroad. More importantly, it would have established a process whereby foreigners impacted by the operations could lodge complaints, which would then be investigated. If the investigation confirmed corporate non-compliance with the standards, then public financial support, such as from Export Development Canada and the Canada Pension Plan, could have been withdrawn as a consequence. The extractive industry was vigorous in its opposition to the bill. 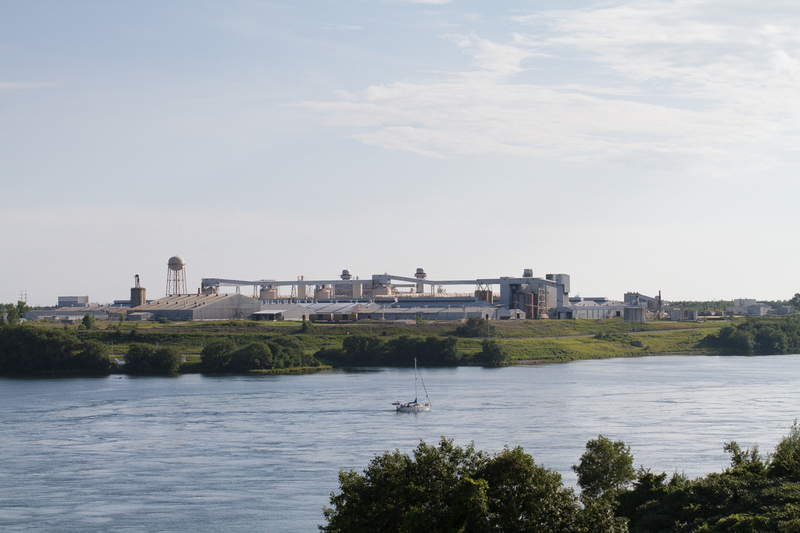 For example, in its lobbying effort, the Prospectors and Developers Association of Canada stated that the proposed measures were unprecedented and would have rendered Canadian companies uncompetitive. Interestingly, it advocated waiting for specific recommendations to be made by John Ruggie, who at that time was leading the incorporation of the UN’s Guiding Principles on Business and Human Rights into the OECD’s Guidelines for Multinational Enterprises. The very same month that the vote took place, Ruggie actually stated that “the option of denial of public advantages must be kept on the table”. In opposing the bill, former Minister of Natural Resources Lisa Raitt argued “The complaints process itself in the bill is irresponsible because it would offer no protection for responsible Canadian companies that are faced with false allegations.” This concern seemed to echo that of the Association of Mineral Exploration British Columbia, which worried that “Although section 4(7) of C-300 allows the Ministers to dismiss a complaint determined to be “frivolous or vexatious,” they must also provide reasons for this determination and publish these reasons in the Canada Gazette. This requirement will make it almost impossible to dismiss a complaint, out-of-hand, without some sort of an examination”. Personally, I do not consider out-of-hand dismissals as an effective method for change, and I consider the underlined portion to be desirable. The vote was close. The issue is clearly divisive. I don’t agree with the Mining Injustice Solidarity Network that CSR and voluntary principles are “meaningless industry jargon”, but I certainly believe they should be supplemented by “hard laws” to deal with serious violations. Since C-300 was shot down, human rights violations surrounding resource extraction have remained global impediments to peace and sustainable development. For example, Hudbay Minerals, a Canadian mining company founded in 1927, is facing three lawsuits regarding alleged murders and rapes committed in 2009 by security personnel belonging to one of its subsidiaries in Guatemala. The victims were Mayan Q’eqchi’ opposing mining operations or occupying contested territory (after these incidents, Guatemala’s highest court ruled that the Q’eqchi’ had legal rights to the contested lands). Hudbay’s defense alleged that there was no cause of action. First, it argued that the subsidiary operating in Guatemala was a distinct legal entity and that the criteria for piercing the corporate veil were not met. It also argued that there was insufficient foreseeability and proximity to establish a duty of care between Hudbay HQ and the Q’eqchi’, and that holding them responsible would be akin to holding them vicariously liable for the actions of their subsidiary. Of note, Hudbay’s defense also argued that policy considerations negated the recognition of a novel duty of care, and listed Bill C-300’s defeat as evidence of that policy. In June 2013, the Superior Court of Ontario dismissed Hudbay’s motion to strike, ruling that it was possible for the plaintiffs to prove that the subsidiary was acting as an authorized agent of Hudbay and that the elements of a novel duty of care could be demonstrated. NGO’s have interpreted this to mean that a “Canadian company could be held legally responsible for crimes committed in Guatemala”. I would put emphasis on the “could”. On the legislative side of things, in the U.S., the Dodd-Frank Wall Street Reform Act mandated the Securities and Exchange Commission (SEC) to issue a rule that would require SEC-listed extractive companies to issue an annual report disclosing any payments made to foreign governments, including the type and amount of payment for each individual project. The main idea is that by making the exchanges between extractive companies and foreign governments more transparent, citizens in resource-rich countries will be able to hold their governments more accountable for their use of the revenues, decreasing corruption and increasing benefits to the population and affected communities. The SEC issued a strong rule in 2012, requiring that the disclosures be public, disaggregated, and free from exemptions. The American Petroleum Institute successfully challenged the SEC’s rule, arguing that full public disclosure would render extractives companies uncompetitive and would violate contracts with countries that prohibit public disclosure. The U.S. District Court remanded the rule to the SEC to be rewritten, ruling that the SEC misread Dodd-Frank’s mandate regarding public disclosure and that its refusal to recognize exemptions was “arbitrary and capricious”. The SEC plans to release its second attempt at a rule by March 2015. While the U.S. efforts have stalled, they have spurred similar endeavors in the EU, Norway, and Canada. In June 2013, Stephen Harper announced that Canada would adopt transparency rules requiring disclosure of payments by Canadian extractive companies to foreign and domestic governments. In March, Minister of Natural Resources Joe Oliver asked for provinces to adopt the measures through their own securities regulators. 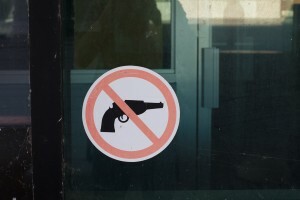 Otherwise, the plan is for federal legislation to be enacted by April 2015. Considering that similar legislation will be implemented in Europe and the States, it is unlikely that these measures will be successfully attacked as anti-competitive. Hopefully, legislators won’t be deterred by the petroleum lobby’s challenge of Dodd-Frank and will draft strong laws requiring project-level and public payment disclosures without exceptions, as recommended by the Resource Revenue Transparency Working Group. Although revenue transparency by itself is far from sufficient to tackle the resource curse, it is a laudable first step, and hopefully one that we can take without faltering. Eventually, however, if Canada truly seeks a reputation as an international leader in promoting human rights, I believe a closer examination of our extractive industry is called for, along with mechanisms to hold Canadian corporations accountable for any possible contributions to human rights violations. 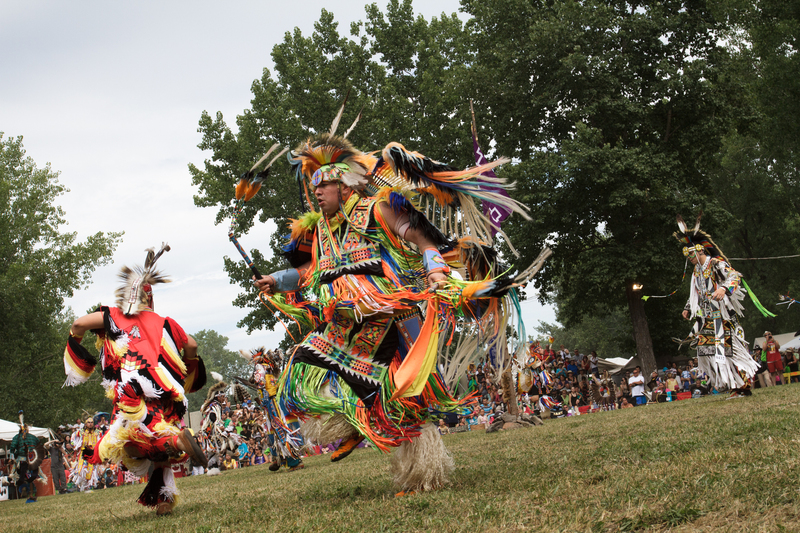 Published by matthewmillman on August 17, 2014 at 1:12 pm under In the field. 0 comments. Être stagiaire à la Cour interaméricaine des droits de l’homme, ça implique travailler des heures incalculables à décortiquer et analyser les pires cas de violations des droits de la personne en Amérique latine. Mais ça implique également travailler sur des dossiers confidentiels, il m’est donc difficile de commenter mon travail quotidien à la Cour. Voilà pourquoi je vais vous parler pêle-mêle aujourd’hui de trois sujets, de la bizarrerie quotidienne de San José à certains évènements marquants qui ont généré bien des réflexions parmi les stagiaires de la Cour. San José, Costa Rica, c’est une ville sans adresse, sans nom de rue et sans numéro d’édifice. Je crois bien c’est la seule capitale d’Amérique latine ainsi. Le stagiaire s’en rend compte dès le premier jour, où trois lignes entières du formulaire d’identification sont dédiées à « expliquer » son adresse. À San José, on se retrouve (ou plutôt, seulement les taxis s’y retrouvent! ), avec une adresse comme celle-ci : 200 metros sur y 100 metros este de la antigua panaderia de San Pedro (l’ancienne boulangerie). Il y a plusieurs éléments à décrypter dans cet énoncé. D’abord, est-ce qu’on doit vraiment évaluer la distance parcourue en mètres? Heureusement non, bizarrement, un coin de rue équivaut à 100 mètres, peu importe sa réelle longueur! Il faut aussi constamment savoir où est le nord, sud, est et ouest pour s’y retrouver. Mais le pire selon mon collègue tico (lire ici : costa ricain), c’est l’incompréhension intergénérationnelle qui résulte de ce système géographique. Parfois, le point de repère principal n’existe plus, comme c’est le cas de l’ancienne boulangerie. Les personnes âgées et les chauffeurs de taxi vont savoir où la trouver, mais les jeunes et les voyageurs de passage, aucune chance. Donc attention, si vous passez par San José, oubliez votre GPS, amenez votre boussole! Vivre la Coupe du Monde 2014 au Costa Rica a généré en moi des sentiments bien contradictoires. La Sele tica (sélection de soccer costaricaine) a atteint pour la première fois dans son histoire les quarts de finale, devenant la « surprise » du Mondial. Des milliers de personnes ont déferlé à chaque victoire à la « Fuente de la Hispanidad » à 500 mètres de chez moi (cinq coins de rue! 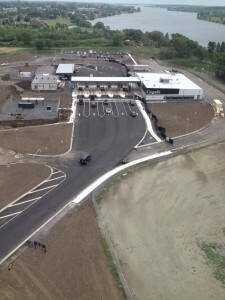 ), le point de ralliement des festivités, qui est pourtant un rond-point d’autoroute. Ma première entrée dans la salle d’audience de la Cour interaméricaine, une belle salle solennelle avec tous les drapeaux des pays membres de l’Organisation des États Américains, a justement eu lieu pour regarder l’un de ces matchs avec tous les stagiaires et avocats de la Cour, tous pays confondus. J’ai suivi le match où le Costa Rica a perdu à un cheveu en pénalités contre la Hollande dans un petit village de la côte caraïbes et je n’oublierai pas de sitôt la vieille dame afro-descendante derrière moi qui pleurait en se lamentant bien fort : « hijos mios, se merecian la victoria, pero les amamos, les perdonamos… ». Même si on n’aime pas nécessairement regarder le soccer, comme c’est mon cas, impossible de ne pas se laisser emporter par cet enthousiasme et ce patriotisme. Justement, à bien y réfléchir, là est mon inconfort. 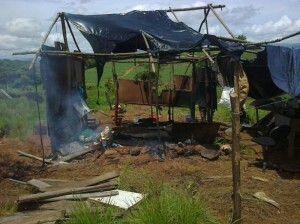 Mentionner les milliers d’expropriations et d’expulsions pour les constructions des stades dans 12 villes brésiliennes, les dépenses exorbitantes dans un pays où les inégalités sont si fortes, les opérations controversées de « pacification » dans les favelas ou le mouvement de boycott du Mondial m’a attiré au mieux un regard d’indifférence, au pire une réaction outragée. J’étais aussi surprise de constater que peu de stagiaires et d’avocats de la Cour ont mentionné ces enjeux durant les maintes rencontres sportives. Les discussions de couloir et de cafétéria portaient presque seulement sur les résultats des diverses Sele d’Amérique latine et la fierté d’être colombien, mexicain ou tico. Nuancer les bienfaits du fûtbol et du Mundial au Costa Rica, c’est pratiquement sentir qu’on est contre l’intérêt patriotique du pays. Je ne peux pas m’empêcher de penser que si autant d’énergie, de ressources et de solidarité étaient dédiées au changement social, les résultats seraient incalculables. Autre moment historique : la première visite du Secrétaire Générale des Nations Unies à la Cour interaméricaine le 30 juillet 2014. 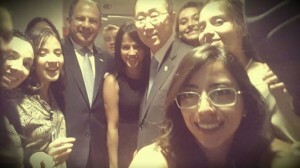 Alors que la plupart des stagiaires tentaient d’intercepter Ban Ki-moon pour prendre un selfie avec lui (ils ont d’ailleurs réussi, avec les Présidents du Costa Rica et de la Cour en prime), une manifestation de dizaines de personnes s’organisaient devant la Cour. Tout un contraste! Mentionnons que la plupart des stagiaires de la Cour proviennent des universités privées d’Amérique latine ou font partie de la classe sociale favorisée de ces pays et ne sont généralement pas très portés sur la manifestation. Les manifestants tentaient d’attirer l’attention de Ban Ki-Moon et des médias sur deux enjeux de grande importance: les titres autochtones dans la région de Salitre et l’invasion de Gaza par Israël. 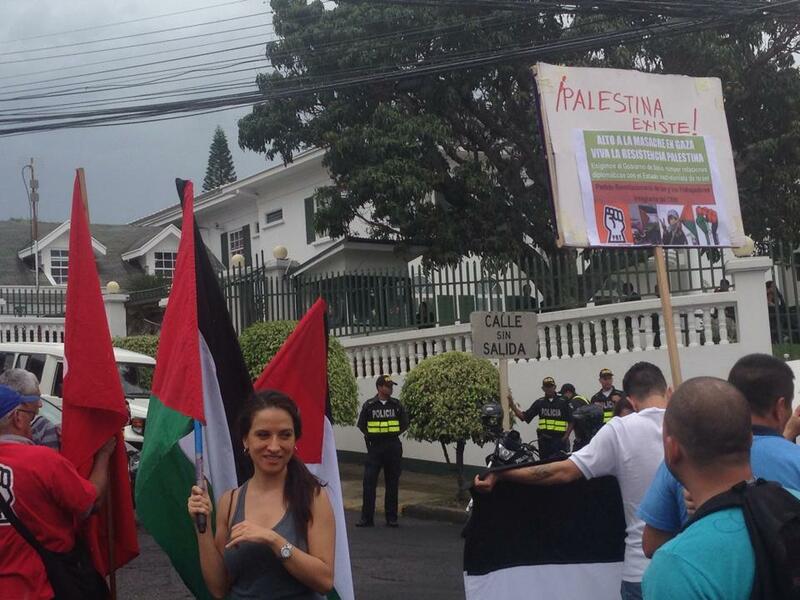 Puisque le monde entier a les yeux rivés su Gaza, parlons de Salitre. La reconnaissance légale des territoires autochtones au Costa Rica est à des années-lumière du système de réserve prévu par la Loi sur les Indiens au Canada. Alors que « sa majesté détient des réserves à l’usage et au profit des bandes » au Canada, la Ley indigena de 1977 au Costa Rica prévoit que les communautés autochtones ont la pleine propriété de leurs territoires, lesquels sont « inaliénables et imprescriptibles, non transférables et exclusifs aux communautés indigènes qui les habitent ». 8 groupes autochtones se partagent 23 réserves à travers le Costa Rica. Mon collègue colombien m’a un jour affirmé qu’en théorie, la Constitution colombienne est celle qui garantit le mieux les droits humains dans le monde, même si la réalité en est bien loin. 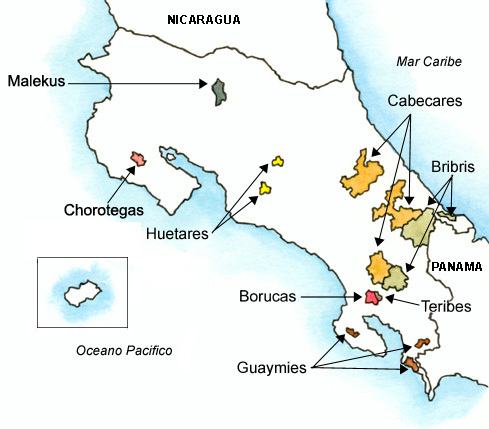 La même équation semble s’appliquer aux droits territoriaux autochtones au Costa Rica. Les dirigeants de la communauté bribri de Salitre estiment que 40% de leur territoire est occupé par des finqueros non autochtone, ce que la Ley indigena interdit. Certains ont occupé par la force ces terres, alors que d’autres les ont acheté, ce qui est également interdit par la Ley indigena. En 2008, les tribunaux ont réaffirmé l’illégalité et la nullité juridique des achats et transferts de territoires à des non autochtones. En juillet, de nombreuses familles autochtones ont érigé des campements sur ces terres occupées, mais certains ont été incendiés et une centaine de finqueros ont bloqué l’accès au territoire bribri dans la nuit du 5 juillet. La tension est redescendue depuis et la Vice-ministre a clarifié que les non autochtones devront quitter le territoire. La solution qui se profile à l’horizon? Le gouvernement offrira probablement des compensations aux finqueros afin qu’ils quittent définitivement le territoire. Notons tout de même que fort malheureusement, de terribles cas de violations de droits de la personne n’arrivent jamais à la Cour, faute de ressources, de connaissances des victimes de leurs droits, de peur des représailles, de ratification par l’État concerné, etc. Je dis ici Amérique Latine puisque ni le Canada ni les États-Unis n’ont ratifié la Convention Américaine relative aux Droits de l’Homme, qui ouvre la possibilité pour la Cour de recevoir des plaintes individuelles. Je fais ce constat avec tout l’amour et le respect que j’ai pour mes adorables collègues. De nombreux facteurs peuvent l’expliquer: le fait que les stages à la Cour ne sont jamais rémunérés, que beaucoup d’universités privées en Amérique Latine sont de fervents participants et gagnants des divers concours de plaidoirie en droit interaméricain, que la pratique juridique en droit international des droits de la personne n’est généralement pas une branche lucrative du droit, mais attire une forte aura de prestige, etc. Je tire ces hypothèses de mes conversations avec mes amis et collègues. Art.18 (1) de la Loi sur les Indiens, L.R.C. (1985) ch. 1-5. 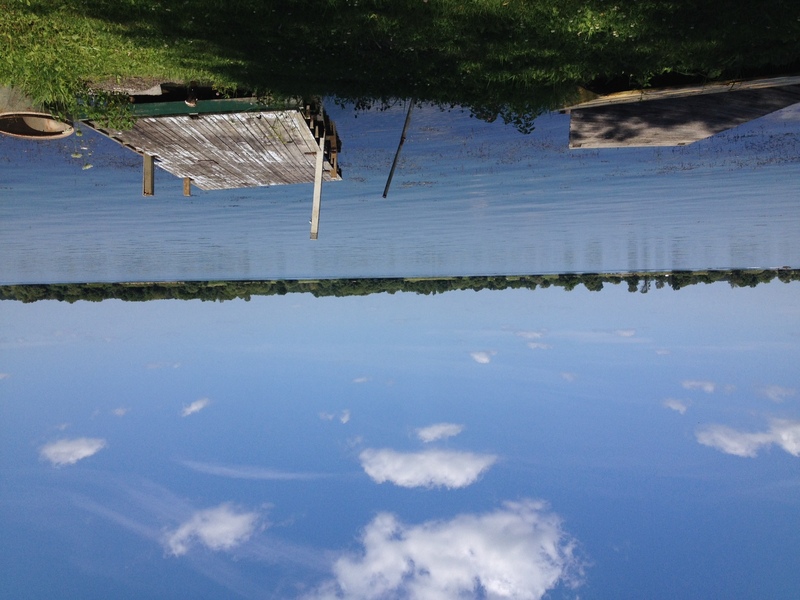 Published by jacinthepoisson on August 14, 2014 at 4:03 pm under In the field. 0 comments. My colleagues asked me to write a retrospective of my twelve weeks at CEHURD. Much as I am looking forward to cheese curds, CanLII, and public transit, it has been a spectacular summer. I came to Uganda hoping to learn about how law interacts with ground realities to produce good or bad outcomes. My experiences here taught me a great many things about working in law, and the issues surrounding ground realities were chief among them. The real lessons tend to be fairly specific, so this summary is slightly trite, but bear with me anyway. Let’s start out really obvious: ground realities are shocking. I spent some time on a lawsuit against a hospital whose doctor took several hours to attend to a woman named Irene, even though she had a ruptured uterus. Irene ended her life begging for mercy while her husband watched helpless. Around a quarter of HIV-positive Ugandans do not receive public anti-retroviral treatment — yet HIV-positive mothers are sometimes forced by their families to breast-feed their children, giving them HIV in turn. I have read hundreds of pages of Ugandan health policy, and much of it is first-rate. But policy solves nothing without implementation, in which case it isn’t much comfort to Irene’s family. People are varied and pragmatic, and Ugandans are as varied and pragmatic as anyone. At a trivial level, people’s response to a mzungu varied from cynical opportunism to kind hospitality — more of the latter, happily! Less trivially: many doctors in Uganda demand bribes from the patients, even when the patients’ conditions are life-threatening. However, there are also Ugandan doctors who travel long distances by motorcycle to deliver urgent care to patients who cannot reach the hospital. Others even pay for emergency treatments out of pocket when the patient is destitute. Health interventions tend to aim at the median of the target group — that isn’t a bad thing — but it is worth remembering that generalizations about a country of thirty million are, well, generalizations. Gender relations and other inequalities have an enormous impact on access to health, especially as it relates to combatting HIV. Both women and men hate to get tested, and rarely tell sexual partners their HIV status — men because nobody will sleep with an HIV-positive person, and women both for that reason and because they are afraid their husbands will throw them out. Wives don’t always have a choice about whether to sleep with their husbands, which also transmits HIV. Health centres try to overcome the testing barrier by including HIV testing with regular services like antenatal care — but men see ANC as a women’s job, don’t like sitting in waiting rooms full of women, and don’t come. 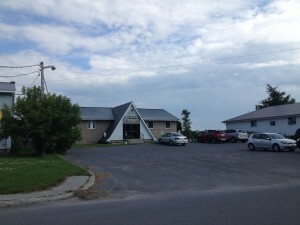 Then the health centres resort to discrimination to try to bring in the men. NGO’s, incidentally, make the problem worse — NGO’s usually present testing men as just another way to protect women and children, so men don’t perceive the health benefit to themselves. Poverty has comparable effects: the impoverished lack resources to protect themselves against exploitation, and yet cannot afford to be exploited. Reduce inequality, and the right to health improves. However, the dominant issue I have seen everywhere this summer is limited capacities. I went on a field visit in June to meet with doctors. They complained of lacking surgical gloves, blades, and essential medicines. Boxes of pharmaceuticals reach health centres almost empty. Health centres never receive the beds they need. There are never any funds to repair equipment — if something breaks, it just rusts. Private health providers pop up everywhere to fill the gaps, but many people cannot afford to pay — so they die instead. Private clinics are often run by public doctors; doctors barely earn a subsistence wage, so they illicitly open private clinics and try to force patients to use their clinics instead of the health centres. Policies can ameliorate such problems: for instance, donors should always budget for training and repairs, and good lines of accountability keep corruption in check. That said, funding levels always limit services, and that in turn limits outcomes. Limited capacities also affect the law. Good policymaking takes time and expertise, and time and expertise cost money. Uganda does not always end up with the laws, regulations, and programmes it deserves, simply because the funds are lacking to create innovative solutions. CSO’s are constrained, too — there are ideas and strategies that CEHURD would undoubtedly pursue much further if there were donors to support them. Just like doctors and patients, policymakers, lawyers and CSO’s have to make do with what they have. However, there is reason to hope. At a grand level, Uganda’s health is improving: more people are getting vaccines, ARV’s, etc. ; health facilities are slowly improving; people are living longer. At the ground level, the people I met, from elites to subsistence farmers, pay attention to health issues, are learning how to make the most of their situations, and are ready to hold the authorities accountable for upholding Ugandans’ right to health. Dear authorities, take note. People are unusually afraid of the future in Uganda — Milton Obote, Idi Amin, and Joseph Kony (among many others) have given people good reasons to think of the current peace as an aberration — but Uganda is getting wealthier, and its people increasingly want a hard look at how that wealth is spent. Health is improving, and expect it to improve a whole lot more. Published by Matthias Heilke on August 9, 2014 at 3:52 pm under Arrivals and departures. 0 comments. I was super excited when I found out that I would be working at the One Earth Future Foundation this summer, both because I knew it would be a fascinating place to work and because I had never spent any significant amount of time in the U.S. and was curious about what it would be like to live here. Throughout the last months of interacting with my co-workers and roommates, I’ve learned a lot! The Fourth of July is not a day but a week-long celebration. The group of interns went tubing on Boulder Creek and had a fantastic day! Colorado, and specifically Boulder, fits the stereotypes. Boulder is often called the fittest city in America, and I can definitely see why! Everyone runs marathons, or ultra-marathons for that matter, does triathlons, ironmans, rock-climbs, does yoga etc. It’s both terrible for my own ego and fantastic motivation! Politics comes up quite frequently in conversations (I might have something to do with this…) Somewhat counterintuitively, marijuana was legalized in Colorado in January of this year, yet gay marriage is not. I asked around about this and found out that Colorado has both some of the most liberal and most conservative cities in the country. This results in some seemingly inconsistent laws. In terms of local perspectives about Canada, we discuss healthcare a lot (of course), and I found out that Rob Ford has overtaken Justin Bieber as the most famous Canadian. Excellent. Similarly, talking about Canadian and American history yields some interesting discussions. For some reason or another, I started talking about the Loyalists and was immediately shot down with a “You mean the Tories??”. On the work side of things, I’ve noticed a difference in how Canadian and American universities approach political science (my undergrad). I talked a little bit about how OEF is “relentlessly empirical” in my last post. American universities approach political science similarly, very quantitatively, while Canadian political science is more qualitative. Well, my first assignment required a decent knowledge of working with data sets and statistics … Luckily I used one of my electives in undergrad to take a statistics class! So there haven’t been many major adjustments and the few that we have come across are more entertaining than anything. Hiking (and driving) in miles seems to take forever, I still spell “Canadian”, and don’t even get me started on my dislike of dollar bills. But, overall I love Colorado! 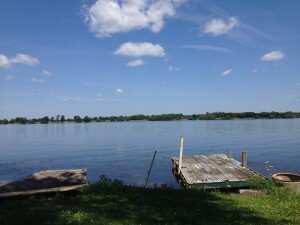 Published by Stacey Smydo on August 7, 2014 at 11:46 am under Uncategorized. 0 comments. The International Human Rights Training Program organized by Equitas for the past 35 years has been a site of participation, learning, teaching, laughter and dance. Participants from all around the world gather to learn from one another and explore methods of human rights education. Over the years, the program and its curriculum has evolved but maintained a strong focus on education and gender. As a training program for human rights educators, Equitas does a fantastic job of creating a comprehensive manual and emphasising the participatory element of education. Its program starts with the individual and spirals outwards until it involves the greater international community. What interests me is the fine balance of choosing topics of discussion that will engage everyone without being too western centric in nature. How you chose what to teach in a program that brings together such a diversity of participants? 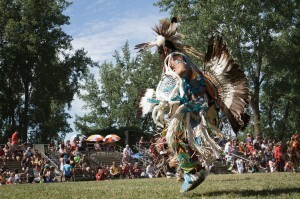 First, let’s consider the plenary session on aboriginal rights. This is the most Canadian focused presentation at the IHRTP and I think one of the most important plenaries because it offers an image of Canada as a country that continues to struggle with, and infringe, human rights. Participants were shocked to hear about the living conditions of some aboriginal communities in Canada and the plight of native women. I think even many Canadians would be shocked if they knew the situation of aboriginal people in Canada and that this reflects a purposeful blindness and silence in our education. What I wonder, however, is whether a Canadian centric plenary is appropriate in a program that brings together people from all over the world. Isn’t it privileging a particular country’s version of the issue? Another thing that surprised me, as someone with a background in religious studies and gender studies, was that discussions about freedom of religion and LGBTI rights, while addressed, were additional evening sessions. Participants had to sign up for them. 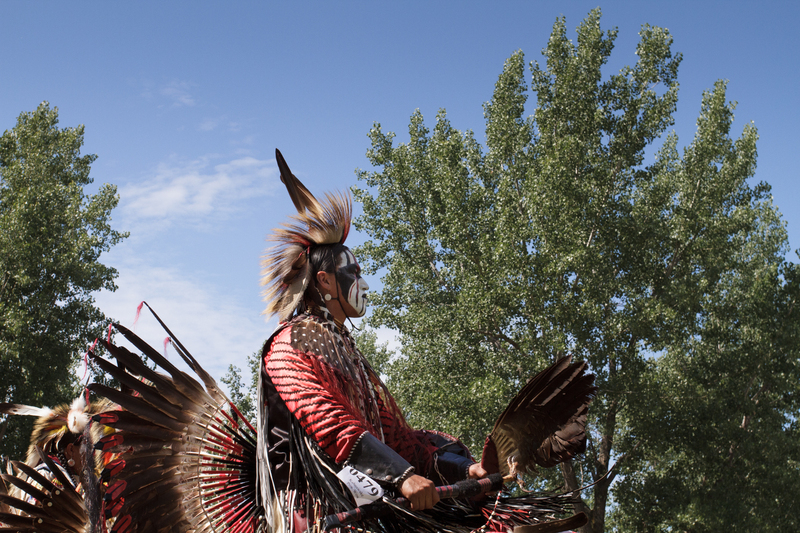 In North America, these topics are at the forefront of conversations about human rights. They remain extremely controversial around the world. We can’t ignore them but as one participant said, “maybe there are other issues that are more at the forefront of human rights violations in my country”. 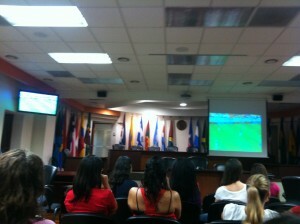 While this may be the case, more than 2/3 of participants attended the LGBTI session. The freedom of religion session, while smaller, brought together people who engaged directly with this issue and people who felt religion affects their work and wanted to talk about ways in which to address this underlying issue. These are issues people want to talk about. Are they truly so divisive that integrating them in the actual curriculum would be exclusionary? If you cant talk about it here, where can you? I didn’t write this entry to come up with answers. There are pros and cons to whatever way you chose to implement “hot-topics” in a training conference about human rights. I think that my own engagement acts as a great example of how our own cultural perspective shapes our study of human rights. What is most important is to be reflective and aware of where these opinions and beliefs come from. To end, I’d like to retell a small story I heard during my first week at Equitas. While the impact might be lost in the retelling, it was a great way to start me thinking about cultural relativism and the importance of self-reflection. There’s a young girl who asks her mother – Mama, why do we cut off the turkey’s neck at Thanksgiving? Is it important? Her mother answers – I don’t know, we’ve always done it. The young girl goes to her grandmother and asks her the same question. The grandmother’s answer is the same – I don’t know, we’ve always done it. As the little girl asked more and more people, she keep getting the same answer. She was sure there must be a significant reason since it was something they had always done. Finally, the young girl ask her great-great-aunt. Her aunt looked at her and said – It’s simple, the bird doesn’t fit in the oven if you don’t chop off the neck. 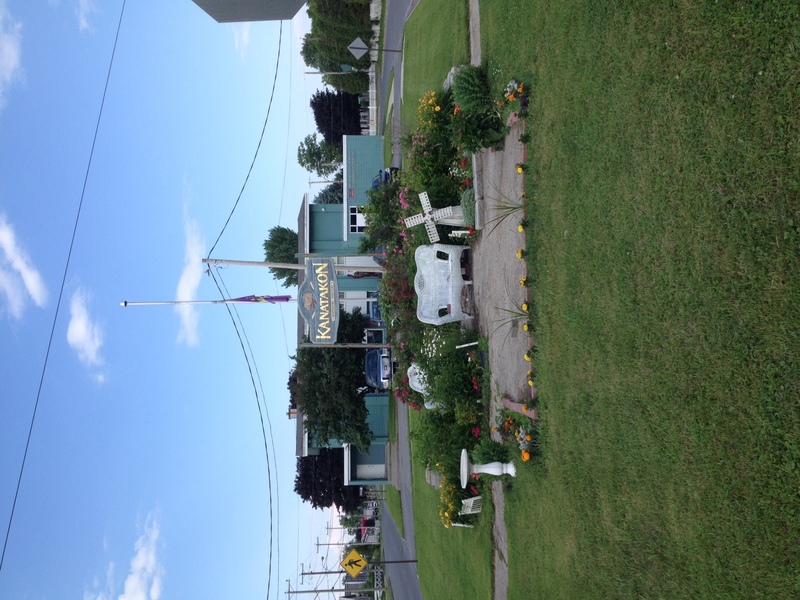 Published by Arielle Corobow on August 7, 2014 at 10:43 am under Uncategorized. 0 comments.